Updated post! I wrote this as our own checklist for places to visit in Paris back in 2017, in preparation for our own trip to the French Capital. 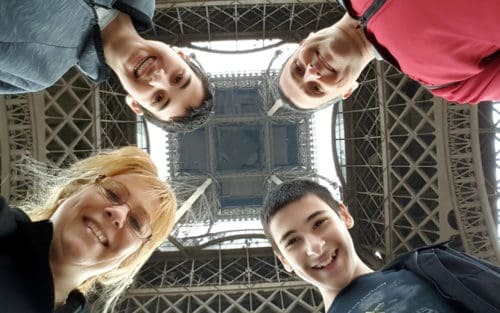 We had a fantastic visit which you can read about in my Paris Trip Report.We ended up visiting some of these places – but not all. I’m updating this post today (April 2018 – a year later!) to reflect what we did and what we didn’t do and why. I still think it’s a great list of places to visit in Paris so I’ve kept the original list intact. The only difference is that this post now includes my new comments and remarks, following our trip. To make things easier, I’ve added the new input in italics. So, how do I go about deciding what we want to see where? I start with reading online – all over the place -and checking for the best places for our family: 2 parents and two teenagers who love science, history and general sightseeing. I check everything, including opening hours and prices (all available in this post) because we do travel on a budget and can’t afford to take daily helicopter rides over the city (or any helicopter rides, for that matter, regardless of frequency). There is obviously no shortage of places to visit in Paris. Once you include science and natural history museums, zoos, all churches and basilicas, markets and other points of interest, the list becomes almost endless. 1. Can be enjoyed by English speakers. Many places had to be taken off the list because it’s all in French. We love science museums but if you can’t read the explanations next to the exhibit it becomes more frustrating than enjoyable. 2. Unique to Paris and French culture. I am willing to make the effort and read up on a topic first so we can enjoy a visit in a French-speaking environment, but only if it’s something that’s culturally or historically unique and interesting for our family. Just what is affordable is a matter of perspective, of course. To me, it’s also a question of value for money. Generally speaking, up to 100 euros for the entire family is within our budget for visiting a place but only if I feel we’re getting value for our money. Cheaper is preferable. Free is always better! 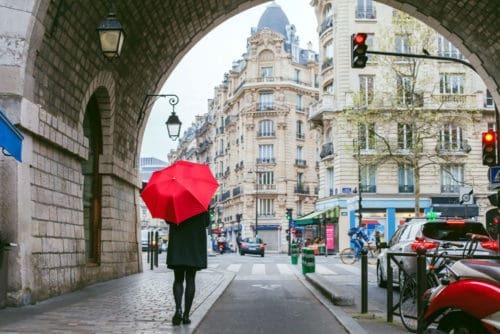 This guide includes only places to visit in Paris itself, within the city outline. 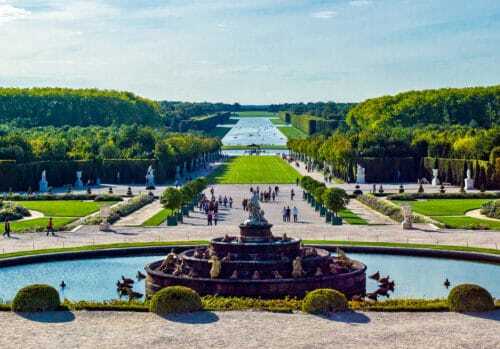 Depending on the length of our stay, we may visit places outside of the city (at least Versailles). These will be covered in a separate post about day trips from Paris. Update: While I never wrote the post about Day Trips from Paris (I will – someday! ), I did write about visiting Versailles! And we did that and had a great time too. I also blogged about visiting Normandy – which can technically be done as a day trip from Paris. You can check out my two posts here: Traveling to Normandy: 9 places you have to visit and Visiting Normandy: WW2 D-Day Sites. There’s a map too! Scroll down for an interactive Google map that shows you where these places are. Probably the most iconic Parisian monument. I never went up the Eiffel Tower myself because the lines were too long. Maybe in March they will be shorter or we could order tickets online (there was no Internet back when I visited. Feeling quite old right now) I’ll have to read up on how to best visit the Eiffel tower. Update: Of course we made it to the Eiffel Tower! We didn’t go up though. There were lines to get on the tower even in late March. However, the security checks just to enter the area were mercifully short! Hooray – we went inside and took some cool photos from underneath this Parisian icon! It’s “just a street” but so much more. 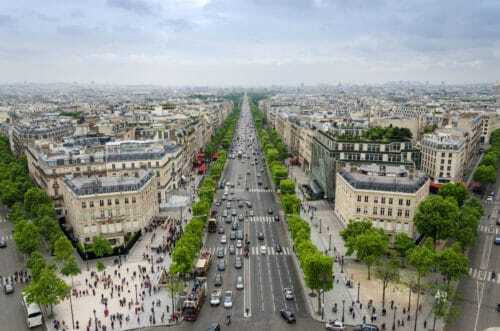 The French call it “the world’s most beautiful avenue” which instantly puts it into the list of places to visit in Paris! With the Place De La Concorde on one end and the Arc De Triomphe on the other, be sure to walk the entire 1.2 miles (1.9 kilometers) of these fabulous avenue. Update: We walked the entire length of the avenue from Arc De Triomphe to the Place De La Concorde. It felt like a long walk, probably because we had already done some extensive walking in Paris throughout that day. I have to say, the Champs-Elysees was a bit disappointing. Compared to other areas that we visited – like Les Marais and the Latin Quarter – it felt a bit too “cold” and impersonal. Which I guess you could say is expected from a large main avenue. Still, with store after store of international brand names, we just didn’t feel that it was too authentic or even pretty. If you’re planning a trip, I still think you should include the Champs-Elysee in your list of places to visit in Paris. Just lower your expectations a little, that’s all. The river is worth a tour in its own right. There are several famous old bridges that cross the river as it flows through the city. I’m going to prepare a guide on the various bridges that are worth visiting and how to best see them. Update: Done and done! That is to say we’ve clearly seen the river and crossed it several times. We also managed to squeeze in a fun boat ride along the Seine. It wasn’t too expensive and provided us with a chance to see the city from a different perspective. Definitely keep this one in your list of places to visit in Paris! I have fond memories from these lovely huge gardens. 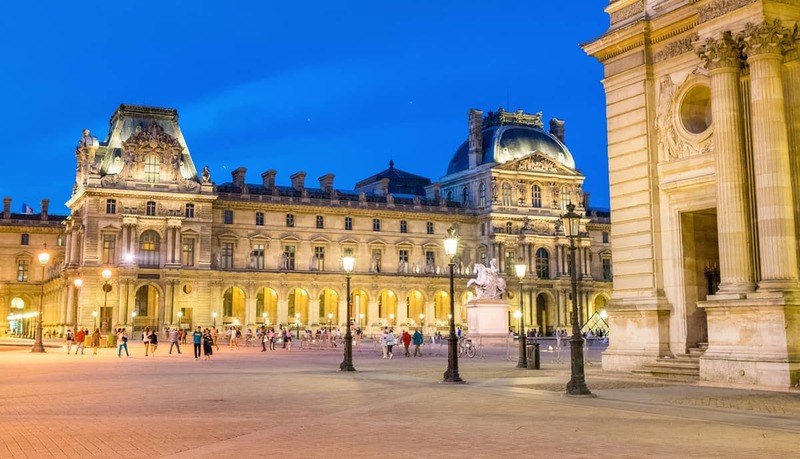 They are located between the Louvre and the Place De La Concorde so we’ll be sure to visit them. Opening hours: From the last Sunday in March to 31 May, and from 1 September to the last Saturday in September: 7m to 9pm / From 1 June to 31 August: 7am to 11pm / From the last Sunday in September to the last Saturday in March: 7.30am to 7.30pm. Update: We spent some time walking around the Louvre and saw the gardens. Quite an anti-climax in late March. Very few flowers, crowded with tourists and not all that appealing, sorry. You’re probably going to go through them at some point as this is a super central area of the city. However, I now think they don’t deserve a spot of their own in the list of places to visit in Paris. The Basilica of the Sacred Heart of Paris (Sacre Coeur) is a magnificent edifice. 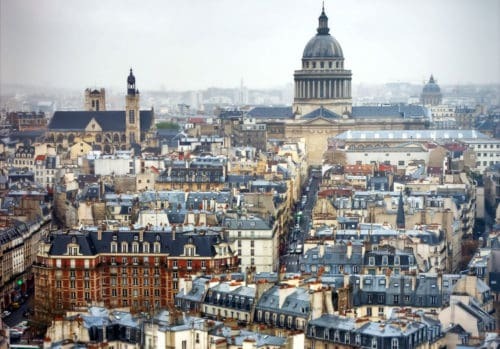 It’s also at the top of the Montmartre – the tallest hill in Paris. Opening hours: The Basilica is open every day from 6 am to 10.30 pm. The dome : 8.30am-8pm from May to September / 9am-5pm from October to April. Update: We didn’t go there. We only had four days and my kids didn’t really to go visit a church. 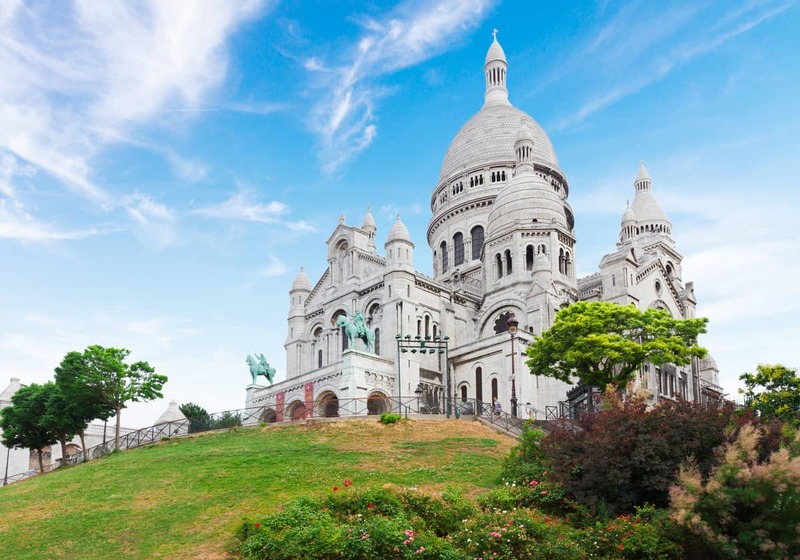 I still fondly remember the Sacre Coeur from my own past visit so if you’re going without kids, I would say definitely pay a visit to the Montmartre. I just don’t have a more current impression from this specific landmark. 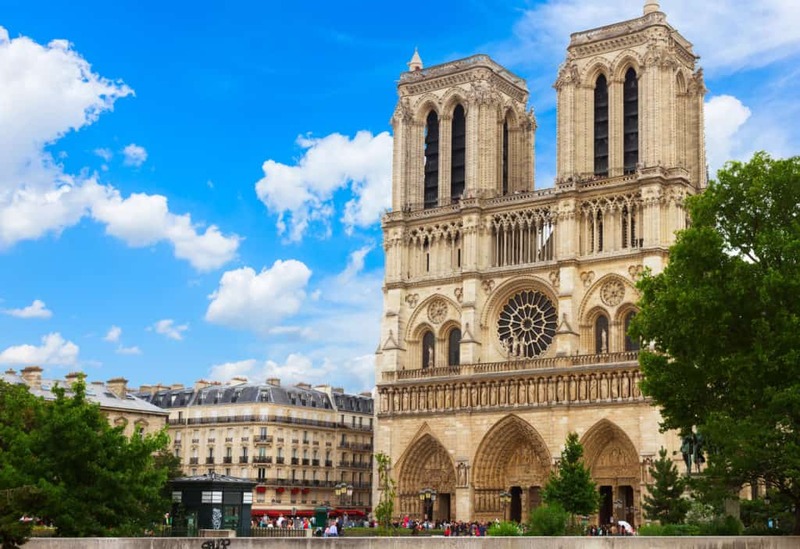 One of the world’s most famous cathedrals, this gothic medieval church is a must-see and easily makes it into our list of places to visit in Paris. Opening hours: 8:00 am to 6:45 pm (7:15 pm on Saturdays and Sundays). Update: Super busy place! We stayed in an apartment that was a close walk from the Notre Dame. The lines go get inside were so long, we could see them before we saw the actual cathedral. No way were we going to stand in line to enter, sorry. 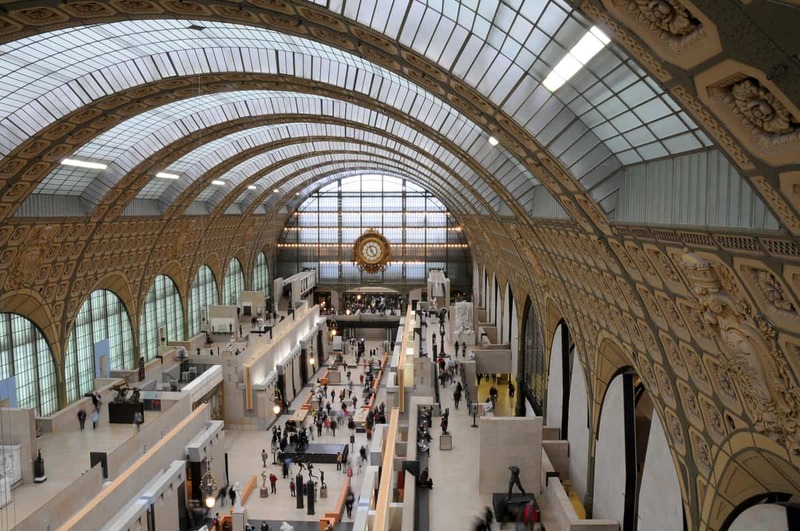 We did enjoy looking at it from outside though so I’d say keep it in your list of places to visit in Paris but if you want to see it from the inside, allocate some time and be prepared to stand in line. This huge modern arch corresponds with the old Arc De Triomphe. Not in the city center, it’s further down on our list but I think we will enjoy the sheer enormity of this monument. Update: We actually did get to the new La Defense arc! We hadn’t planned on doing that but on our third day in Paris we were invited for dinner in the home of a long-lost cousin. Having visited the palace of Versailles on that day, our route back into Paris took us through La Defense train station. We were going to change trains in the station but that proved to be impossible. To this day, I don’t know why our tickets didn’t work. The people in the station didn’t know either. The whole thing was a farce with us unsuccessfully trying to figure out which other train would get us to our destination. To make a long story short – we ended up getting out of the station and catching a taxi to our destination. So we got to visit La Defense. Very interesting area and yes, if I ever get a chance, I think I’d like to return and enjoy the place in depth, rather than just rushing through. Probably The Museum by any measure of the word. There’s so much to see and do in the Louvre, I suspect we’ll go twice for 2-3 hours at the time. It really is more like several museums in one. Opening hours: Open every day except Tuesday 9 a.m. to 6 p.m. Admission costs: €15 adults / Free for kids under 18 / From October to March: access is free for all visitors on the first Sunday of each month. Update: Way way too busy too. We went there twice and tried the hidden entrances I had blogged about here. Nothing worked. The only way inside was via some long line or another. So we settled for enjoying the Louvre from outside! Update: I’m embarrassed to say that we never even tried D’orsay. We just got too busy walking around Paris and doing other things. I can’t even tell you if there was a long line to enter or not! Frankly, there’s only so much art I think we can take in during a short holiday but hopefully we can squeeze in a short visit to the Musee Rodin, even if only to stroll through the beautiful gardens and see the statues outside. Opening hours: Open daily, except Mondays, from 10am to 5.45pm. Update: Never got to see the Rodin museum either. Going over the list now really makes me see how much we missed on! So much for making a list of places to visit in Paris, huh? Though I guess it actually makes sense. I like making list but I also like enjoying the freedom of traveling and just doing what we feel like doing when we reach a destination. The strange and fascinating museum of postmodern art has some fun and interesting displays and exhibitions (not all of them permanent). There’s also a great view from the rooftop. Admission costs: €14 for the museum or €3 just to visit the rooftop observatory. If I’m reading the French leaflet correctly, both are free for kids under 18. Update: We ended up walking along the Pompidou Center and enjoying it – yes again – from outside. Not as impressive as I had remembered it to be. I think it’s showing its age a little which is a problem with a post-modern art museum. But again, not having gone inside, I can’t really say much more. 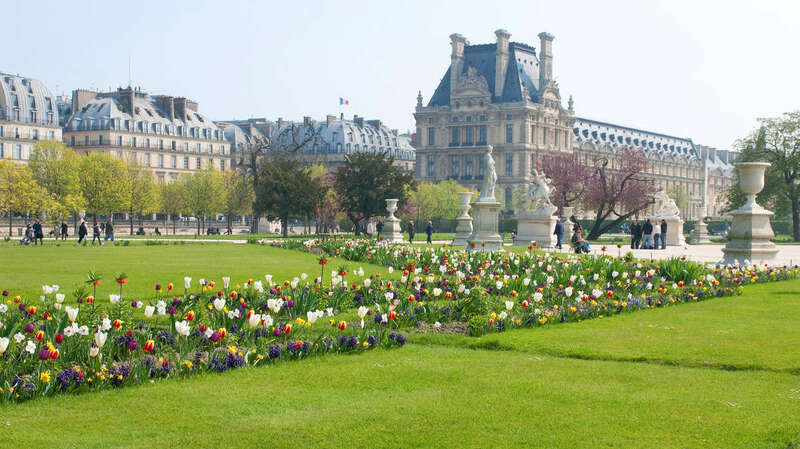 A complex of buildings with the Esplanade des Invalides – a large open space with gardens – in front of them. 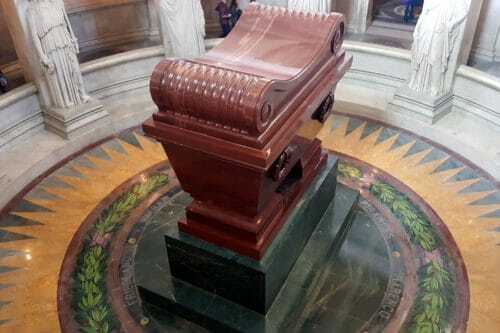 This is a place steeped in military history and where you can visit the tomb of Napoleon. My husband being a military history buff, so that’s why the highly-praised Army Museum (Musée de l’Armée) makes it into our list of places to visit in Paris. The museum is very large so will probably take us at least half a day to visit (if not longer). Opening hours: 1 April to 31 October: Monday to Sunday, 10 am to 6 pm / 1 November to 31 March: Monday to Sunday, 10 am to 5 pm / Closed 1st Monday of every month, except for July-September. There are other closure times, so check before visiting. Update: Finally! A museum I can say we visited! We spent a few hours in the army museum. Lots of displays and a very interesting visit all in all. We could have spent longer there but only had 3 hours to spare. Taking in the displays took longer than we had expected (that’s a good thing!) We basically reached WWI and then had to leave. We did make a point of paying our respects at Napoleon’s tomb before leaving. 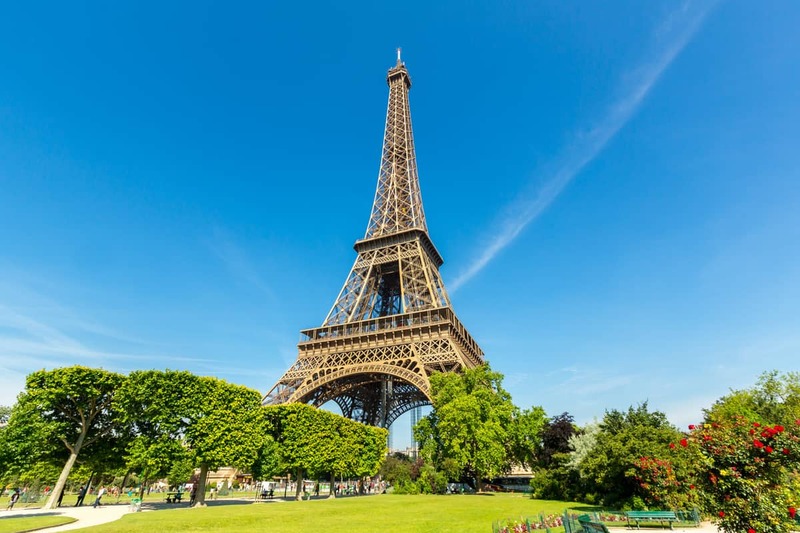 Even More Places To Visit In Paris! 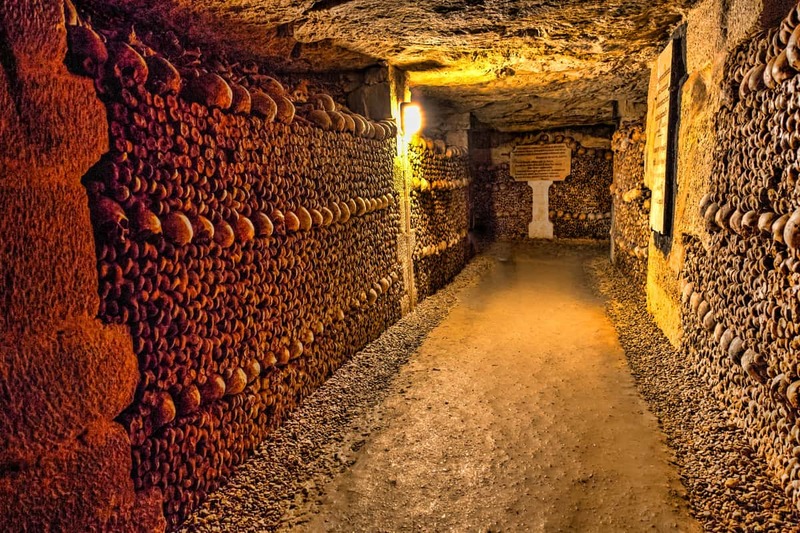 Tres macabre and eerie, the catacombs are these long underground tunnels filled with the human bones of six million dead Parisians. They are damp, claustrophobic, dark and there are human skulls glaring at you. Definitely one of the places to visit in Paris as far as I’m concerned but I’m also the only one in our family who enjoys watching The Walking Dead. So, for now it’s a “definite maybe” on our list. It’s also not cheap at all. According to their website, it’s a journey of 2 kilometres underground, with 130 steps to go down and 83 steps back up to street level. Admission costs: € 27 for adults / € 5 for youth under 17 (they actually say that under 4 is free. If you ask me, anyone taking a child that young into the catacombs should be arrested). Update: We really wanted to visit the catacombs. Alas, when we go there, the line went around the nearby square. We were told the wait time was more than 2 hours, so we passed. We’re not into shopping for clothes as a vacation pastime but the iconic French high-street superstore is worth visiting, even if only for a few minutes. I still remember seeing it all it up with a huge Christmas tree in the middle when I visited Paris years ago. There is now a small art gallery in the store. Update: Never got to Galleries Lafayette – I wish we had. We love seeing animals and a good aquarium is something we enjoy visiting. This one gets good reviews and the price is right, so it’s on our list. Could be a great way to spend a couple of hours if the weather is miserable outside. Opening hours: Tuesday to Friday from 10:00 a.m. to 5:30 p.m / Saturday and Sunday from 10:00 a.m. to 7:00 p.m.
Update: When I had originally prepared this list for us, I was way too optimistic. Looking at it now, I’m not sure what made me think we’d have time to visit such a small museum during our four days in Paris. We had fantastic weather and it never rained, so maybe that’s why. Anyway, in retrospect, this items should not have made the list of places to visit in Paris. At least now when you only have four days! What would I have added to the list? Les Marais – that quaint old neighborhood was our home during our visit. Lovely little streets, a great bakery around the corner from our apartment and overall, a sense of experiencing “real Paris”. 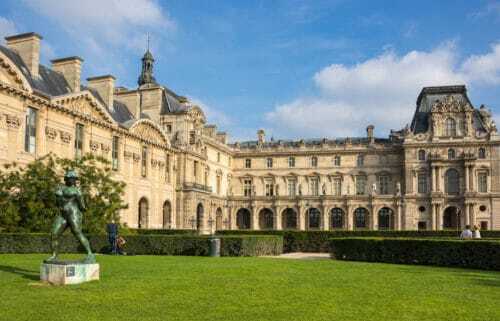 The Latin Quarter, including the Cluny Museum – A lovely area of Paris. Again, very authentic and interesting. If you still haven’t decided where to stay in Paris, check out my post about hotels in the Latin Quarter too for some gems! The Garnier Opera House – A magnificent building! Prettier than the palace of Versailles if you ask me. Well worth a visit, inside and out! Again, see more in my Paris trip report. C’est Ca! This completes our list at this point. And now… Le map! Click on the little icon that’s in the left upper corner and it will bring up the list with place names. Click on any name to highlight it on the map. How about you? Have you ever been to Paris? I’d love to get feedback and recommendations from fellow travelers so don’t be shy and leave me a comment! 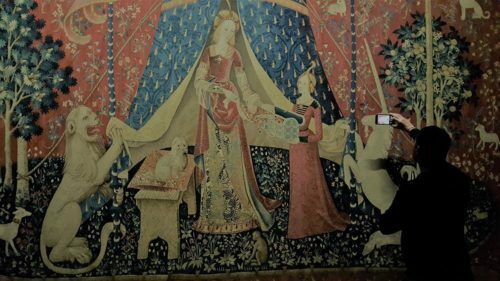 THIS is not a picture of Notre-Dame……. Great article, definitely will take some places from here, I will be there 6 days but not in a rush at all, I am going with 2 toddlers. I have a friend that lives there and I will pass this article and tell her my main places to visit. Thank you!! Thank you! We ended up skipping some things and adding others. 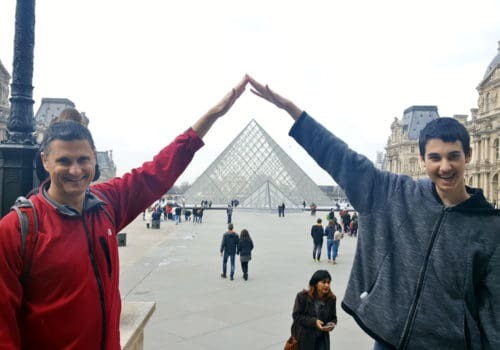 You may want to see my Paris trip report too. Enjoy your visit to Paris! Absolutely! Possibly even longer if you want to go in-depth. And that’s without factoring in the waiting in lines for some of the places.